96% remaining. Typical hours will run 1200-1500 hours. Maximum Resolution UXGA 1600 x 1200 Contrast Ratio (typical) 4000:1. PC Signal Compatibility VGA, SVGA, XGA, SXGA, SXGA , UXGA Macintosh Signal Compatibility Yes. Projector and power cord. We won`t be able to cancel order that already processed. Functional condition Any Other Accessories. HDMI Standard,VGA/SVGA D-Sub. Remote is not included. Unit is in good working condition. Audio Outputs. Video Inputs. It's made to last and it's truly the largest difference between the stuff you "can get" and the stuff you must have to change the way you compute. “ These Boxlight projectors are perfect for back yard movie or football parties. Lamp was only used less than 1550 hours. Resolution: 1280x800. Includes VGA cable, power cord and laser pointer remote. Trending at $58.50eBay determines this price through a machine learned model of the product's sale prices within the last 90 days. Tested and in working condition. Most units still have around 50% life left. Max Sync Rate (V x H): : 120 Hz x 108 kHz. 1080P, 720p, 1080i resolutions! THIS PROJECTOR WILL WORK WITH --BANQUET HALL OR CONFERENCE ROOM. -OUTDOOR / BACKYARD MOVIE NIGHT. -DVD / BLU RAY PLAYERS. -CAMCORDERS / HANDHELD VIDEO RECORDERS. -PC / MAC DESKTOP AND LAPTOP COMPUTERS. Digital Projection iVision SX DLP Projector. Genuine Digital Projection lamp installed with 1326 hours of use out of 2000 hours total. Genuine Digital Projection lamp/bulb (installed). Projector has been run from us for 8 hours with the installed lamp to ensure full working condition. Mitsubishi EX241U DLP Projector. FREE Accessories Included by TeKswamp for your convenience TeKswamp Warranty. So, Why Buy from TeKswamp?. But what is the best way to make sure that you are buying from a trustworthy source?At TeKSwamp we have more than 10 years of positive experience specializing in refurbishing electronics! You are buying a Boxlight Seattle X30N XGA Projector as seen in pics. Projector Size details and specs from web below. we took one out for pics. Zoom Lens Lens Focus Lens Shift no international. This is a projector in my college dorm. It’s a very nice projector, we watch all the sports events on it and is projected in clear 1080p at 60hz and in the pictures is at 110 inch display and it’s 24inch away from the screen. So no shadows when someone gets up. This one has 700 hours on it and have thousands of more left on the bulb. Has all ports for any PS4 ,computer , connection setup. I’m selling because I’m in need of money for a college payment coming up. Thanks for looking! If you have any questions just have to ask! Thanks! Infocus IN102 DLP Video Projector Tested! 700 Lamp Hours or Less! The projectors have been tested and have a great picture. The projectors in this lot have lamp hours that are at 700 hours or below. 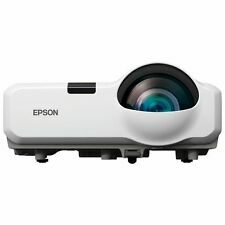 It powers and projects normally with excellent focus and image quality. Connections include DVI, VGA, LAN, component, composite and S-video. The two extendable support legs are missing from the underside of the case. For reference the manual states that the bulb should get 6000 hours in ECO mode and up to 4000 hours in normal mode. Projector Specifics New high-density filter - twice the surface area of our previous generation adds a higher level of protection. “ These Boxlight projectors are perfect for back yard movie or football parties. Less than 1250 lamp hours been used. Still has plenty lamp life left. Includes VGA cable, power cord and laser pointer remote. 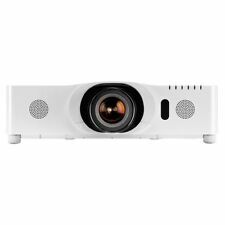 These budget-friendly short-throw projectors minimize shadowinterference and glare, to ensure optimum viewing of your presentations. Using a built-in short-throw lens, theyenable you to project an 80" image from just 2.7–2.9 feet away. 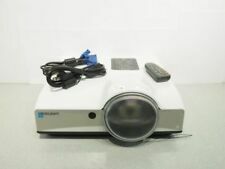 NEC NP-M271X 3LCD Projector. ⦁ Projector Weight: 6.4 lbs. Projector is Professionally Tested and is in Good Working Order. Lamp and filter are cleaned to improve image quality and extend projector life. The CP-SX12000 will provide large screen images for venues such as auditoriums and conventions halls, bringing Hitachi performance to a wide spectrum of possible new uses. The condition is used, but the projector is in excellent condition. This projector has a new lamp installed. Choose the lens appropriate for your application. 3 x 1.22” Inorganic LCDs. However, the 'Lamp 2 Replace' light was blinking during testing and may need to be replaced. Horizontal lens shift left right 10% (calculations based on center lens center image using Standard Zoom Lens). OPTOMA FACTORY RECERTIFIED X355 N:1024X768-XGA/M:1600X1200-UXGA 22K:1-CONTRAST 3. Technology: 0.55" DLP chip (XGA). Type: Laser and LED hybrid technology. Projection lens. - Projector: 3 years. - Light source: 2 years or 6000 hours. - Light source: 5 years or 10,000 hours. Computer: 1 x 15-pin D-Sub (VGA). The diminutive Acer K330 is slightly smaller than a magazine, while providing the latest projection technologies and high-impact performance wherever you go. Acer SmartFormat Technologyconveniently supports comprehensive wide-format PC signals. VIEWSONIC PJ359W PORTABLE WIDESCREEN HD LCD PROJECTOR, ONLY 249 ORIGINAL HOURS! ViewSonic PJ359W (VS12188) Portable LCD Projector. We have experienced Projector Technicians on staff and we have been in the industry for over 5 years. Condition: Used! 161 Lamp Hours! The Actual item(s) shown in the picture(s)! checkout before your order will be cancelled. The order cannot be combined or modified after checkout has been completed. 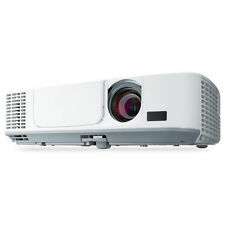 NEC U300X DLP Projector. ⦁ HD Video Mode: 1080i. ⦁ Display Type: DLP. Ultra Short Throw Technology takes the Projector usage to a new level. You can expect large images in small rooms, eliminated eye glare and decreased screen shadows using this technology.